Rote memorization is the exact opposite of understanding. It should be relied upon as little as possible. This method is the result of my contemplating the best way to teach my young daughters (6- and 7-years old) how to play guitar. I wanted a system of teaching that was simple, intuitive, easy for a young mind to assimilate, and progressed in small steps. Indeed, as this method has come together, my own knowledge, speed and ability has improved significantly as well. Truly knowing the fretboard has freed my mind from searching for the next note in the scale to playing what I hear in my head. This method is an intuitive progression of easily digestible chunks of information that, together, grow exponentially until a full knowledge of the fretboard is had. It works equally well for adults as it does for children. If you are like me and after thirty years of playing you are still unable name all of the notes on the fretboard at a moment’s notice, then this course will help you quickly. If you are new to the instrument, this method will allow you to quickly move beyond one of the most painful parts of learning how to play. Starting with the locations of the BC half-step note combination which occurs in only six places on the fretboard in the first 12 frets, we then add the whole-step to the D note. This gives us a note, half-step, whole-step pattern. We then add, using the exact same pattern, the E, F and G notes. Doing so clearly illustrates the clustered relationship of the BCDs to the EFGs. By adding another whole-step to the A, we have in just a few short lessons built the entire C major scale across all 6 strings up and down the fretboard. The BC half-step note combination will be referred to as BC cluster throughout the rest of this course. A very nice side benefit of this method of learning the fretboard is that it frees the student from the limiting factors of the various other methods of learning scales. Now you are no longer playing inside a four or five fret horizon like found in the CAGED or Zone systems. As long as you remember where the half-step clusters occur, you are free to roam around the entire fretboard at will. The BC Cluster is the logical focus point for these lessons due to the nature of their relationship with the EF Cluster (the BC Cluster is almost always on the same frets on the string below) and with the C major scale itself. You’ll notice preferential treatment for the BC Cluster throughout the lessons that follow. I believe it is imperative for the student to utilize the mnemonic provided and to say the notes out loud while practicing all of the following lessons. Doing so will cement this information deep into their minds and allow it to be called upon instinctively thereafter. The fretboard should be the very first thing any new guitar student should learn. By learning and knowing the C major scale on the fretboard by heart, the student is now far better prepared to understand intervals (and in fact has an intuitive knowledge of intervals already), the relationship between the various scales and modes and how chords are built. This progression of instruction for guitar is far more intuitive and easy to learn for the student than by starting with music theory, chords or songs. My daughters had had some experience with piano lessons before starting on guitar, so they carried with them a basic knowledge of the notes and their relationship to one another. Likewise, some basic knowledge of the guitar and music is necessary before embarking on this course. Below we’ll go over the convention for numbering strings, half- and whole-steps, and the notes that make up the C major scale. As per convention, the strings on the guitar are numbered from the highest to the lowest. The first string is the high E string at the bottom of the fretboard (numbered 1 below) and the sixth string is the low E string at the top of the fretboard (numbered 6 below). All of the fretboard diagrams in this book are pictured as if the guitar is laying on the lap of the player with the headstock to the left and the body to the right. This puts the low E string at the bottom of the diagram and the high E at the top. Moving from string 5 to string 6 is moving down. String 4 is below string 2. These are seemingly opposite of what you would expect when holding the guitar and looking at the fretboard, but these directions are referencing the difference in tone rather than physical location. In other words, deeper notes are below and down, higher notes are above and up. A half-step is the distance between one fret and the next; a whole-step is the distance spanning three frets. Normally, one says that a half-step is one fret and a whole-step is two. I.E., the distance between fret 4 and fret 5 is a half-step; the distance between fret 5 and fret 7 is a whole-step. Similarly, the distance between frets 12 and 13 is a half-step, while the distance between 12 and 14 is a whole-step. Most systems will refer to the half-step as being a distance of one fret and a whole-step as being a distance two frets. You’ll notice that the BCs and EFs are the only notes that are each a half-step apart. I call these groupings ‘Clusters’. Because it is the C major scale that we will be building, we are going to use the BC Cluster as our starting point. It is the relationship between the BC clusters and the EF Clusters that is the foundation of this method. Use the mnemonic, seven-two-nine-four-zero-zeven (729407) (the location of the B note across all six strings), to remember the starting fret of each cluster beginning on the low sixth string. The student should play this series of 12 notes forward and backward, each time saying the note out loud. For most people it won’t take long to have cemented these locations and notes into their memory. From my experience, children will learn this much faster than adults will. It is helpful to do the following exercises with a metronome (now available as an app for most smart phones) in order to improve technique and timing. It is easy at this point to expand the BC clusters to BCD Extended Clusters. The D is a whole-step beyond the C and gives us a simple pattern to remember: note, half-step, whole-step. Like the other exercises, the student should practice playing these notes backwards and forwards, while saying the note out loud. Here is the diagram of the BCD Extended Clusters. We got here fast, right? Even young children will get to this point very quickly with only their manual dexterity holding them back. Now we make a fairly large jump by adding only a single chunk of information. We already know the six locations on the fretboard for the BCD Extended Clusters. We now create the Double Clusters by adding the EFGs on the next higher string, again using the note, half-step, whole-step pattern. The student will notice that except for the cluster that spans strings 2 and 3, the EFG clusters all fall on the same frets as the BCDs. The only bit of memorization that the student needs to add here is that the EFG pattern on string 2 is offset a half-step higher than the BCD pattern on string 3. The Rosetta Pattern continues this method with an intuitive treatment of modes and scales. It is now that the locational relationship between these two patterns becomes clear and the fretboard has essentially revealed itself to the student. In four simple and easy lessons, the student now has a vocabulary of 6 out 7 of the natural tones on the fretboard. Using the location of these Double Clusters as a base during practice, the student can shift from one cluster to another as they improvise around the neck always assured that they will be on a proper note in the C major scale. Expand the method previously shown in tablature to practice this full complement of patterns. We now have a very solid understanding of the fretboard built intuitively in small steps from the ground up. To further enhance our knowledge of the fretboard, along with our fluidity and technique, it is worthwhile to use the CAGED method to break any artificial limits in our method of playing. By focusing solely on the clusters, although useful for learning the fretboard, we are inadvertently limiting our possibilities as musicians. Adding other frameworks like the CAGED method to our vocabulary will expand the options available at our fingertips. Practice the above patterns to gain technical skill in moving across strings, improve your knowledge of the fretboard and to increase your speed. Incorporate the clusters to move back and forth between these patterns on any of the strings to vary your play. As always, say the note names out loud and use mnemonics to aide in the memorization of the patterns. Applying the chunked information we learned from the Super Cluster Method to the CAGED patterns allows us, using pattern recognition, to instantly name the notes that we are playing, while we are playing. As you know, a Super Cluster consists of the BCD pattern on the low string mirrored by the EFG pattern on the next string higher. This makes it easy to recognize the BCDs when you are playing because you know that a note, half-step, whole-step pattern within a Super Cluster on the lower string is always a BCD combination. A note, half-step, whole-step combo on the first string (highlighted in green above) that is not part of a Super Cluster will always be BCD. A note, half-step, whole-step pattern within a Super Cluster on the higher of the two strings is always an EFG combination. 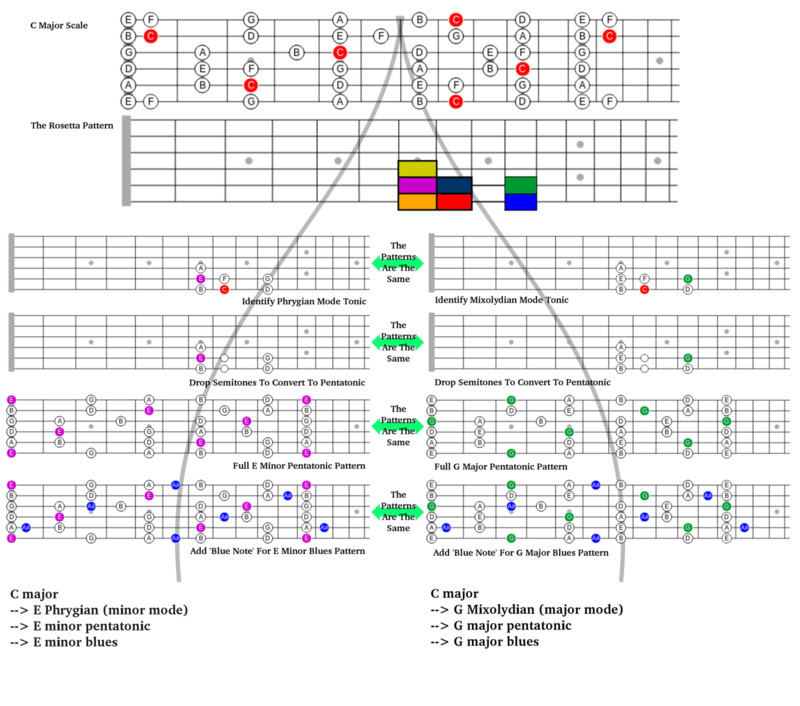 A note, half-step, whole-step combo on the sixth string (highlighted in green above) that is not part of a Super Cluster will always be EFG. A note, whole-step, half-step pattern within a Super Cluster on the lower of the two strings is always an ABC combination. A note, whole-step, half-step combo on the first string (highlighted in green above) that is not part of a Super Cluster will always be ABC. A note, whole-step, half-step pattern within a Super Cluster on the higher of the two strings is always a DEF combination. A note, whole-step, half-step combo on the sixth string (highlighted in green above) that is not part of a Super Cluster will always be DEF. These relationships, with the exception of the GA, are true even when spanning CAGED patterns, so regardless of where you are on the neck, or in which direction you are going, you will always be able to name the notes you are playing. You also may recognize other combinations instinctively as you play. Pay attention to them and try to consciously name them when that happens. Practice this pattern recognition in as many different combinations as possible while playing at speed to truly become proficient. Pattern recognition is one of the key differences between this method and other, rote-memorization based methods. Pattern recognition affords an easy way to know where you are on the fretboard and what you are playing at all times, even if you get lost in the emotion of an improvised solo. With an intuitive knowledge of the fretboard and the ability to easily recognize repeating patterns of notes, an understanding of scales and modes and their inter-relationships is the next obstacle to overcome. I attack those subjects in my next method, The Rosetta Pattern. See the following diagram. The Rosetta Pattern does for modes and scales what The Super Cluster Method does for the fretboard. By that I mean it gives a simplified framework for understanding them in the way that the students learn best. The Super Cluster Method is also available now on Kindle. See my other story, also on medium, for a simplified method for Teaching the Notes of the Musical Staff — A Progressive and Intuitive Method.